Free download Trend Micro Anti-Threat Toolkit latest version. It is a very quick and real time antivirus program. 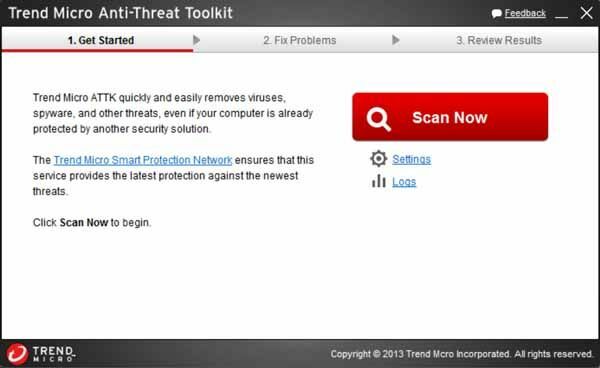 Trend Micro Anti-Threat Toolkit is developed by Trend Micro Inc. There is no need to install it on your system as ATTK provides you online scanning facility using your internet connection. If you are using internet connection, then it is very necessary for you to protect your computer form spyware, malware and viruses. Moreover, if you want to install Antivirus then internet connection is necessary to keep your Antivirus program up-to-date. Trend Micro Anti-Threat Toolkit provides you the facility to scan your computer in real time without installation. It will also work smoothly if you have already installed any other antivirus program on your computer. It is absolutely free and very easy to use and scan. First of all, you have to download the application file. You must have internet connection while running the application file. When you run Trend Micro Anti-Threat Toolkit, it will start to connect Trend Micro Network immediately. After getting some important data the GUI interface of ATTK will start. You will see “Scan” button, press it and it will start to scan your computer. It will take some time to load some processes and then start to scan your C: drive for viruses. You can see the founded threats during the scan. When the complete scan will finish, you can see the complete result. You can also check the complete details of the detected threats.